Gareth Fry is a multi-Tony & multi-Olivier award winning designer, best known for Harry Potter and the Cursed Child, The Encounter, V&A’s David Bowie Is exhibition, and soundscape design for the London 2012 Olympic Opening Ceremony. He has also written Sound Design for the Stage. More info here. 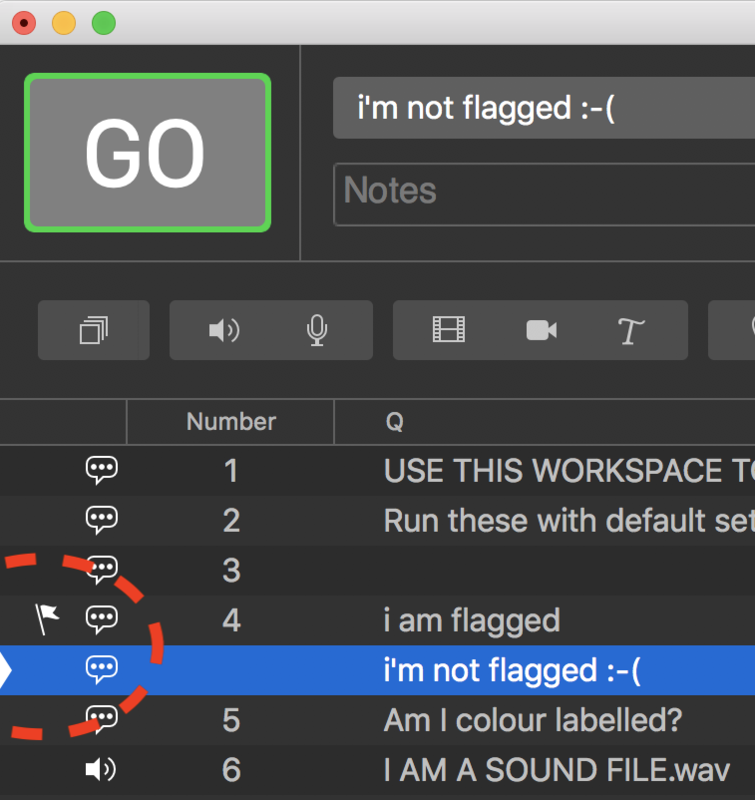 Cue Wizard helps you search and modify specific cues in Figure 53’s QLab, either by searching for text, by cue type (Audio, Video, Fades, MSC, etc) or by other parameters (flagged, broken, cues with specific Colour label, routes to a specific output). * View them one at a time, starting with your current position in the cue list, with a Show Previous / Next interface, allowing you to view, or manually edit the search results. * Modify the cues, either one by one (you’re shown each cue, and how it will be modified, with the option to change it or ignore it); or to go ahead and modify all the search results. You can modify the cues by changing their label colour, whether they’re flagged, or by changing the text in the cue name, number or notes fields, using a range of text operations such as Find & Replace, Add text, Remove text, Add a number sequence, etc. Cue Wizard can also log its searches and modifications to a text file (which is formatted to easily load into Excel too). Search for all MSC cues, you could then modify those MSC cues by doing a Find & Replace on the words “MSC go” in the cue name, and replacing it with “Lighting Cue Go”. They could also be labelled with a Green colour. You could also Search for all MSC cues, and create a log of those search results, whilst opting not to modify anything. Once you’ve setup your search and modify parameters, you can save them as a preset, so you can load and run that preset quickly in the future. There are a bunch of useful presets pre-loaded into the program, such as Find all cues with cue numbers, and add “SQ “ before the cue number. There are also a range of options to choose which cues you might modify or leave alone, set to some sensible options. For example, when renaming cues, you might want to rename Audio cues, but ignore Fade cues, because QLab dynamically alters the name of a Fade cue when you change the name of its target audio cue. This app is only possible because of all the lovely AppleScript hooks that Figure53 have put into QLab, which they kindly helped me understand a few of, and also through the work of Rich Walsh and Mic Pool, whose methods I’ve drawn upon. It is compatible with QLab v4.3.4 onwards (it uses the new Cuelist Parent hook introduced in that). Cue Wizard is free to everyone. As such, no guarantees are made about its performance, and no liability is accepted for loss of work. The app can modify hundreds of cues very quickly so always save your workspaces before running it. If you have any issues with it, or feature tweaks or requests, or want to share a handy preset, please email me directly at garethfry@hotmail.com. Cue Wizard is a development of an app called Text Wizard I wrote for QLab v2 back in 2011. To download Cue Wizard, please enter your details to receive subsequent software update announcements. YOU CAN DOWNLOAD CUE WIZARD HERE. I’ve tried to include instructions on Cue Wizard’s windows to allow you to operate it without reading this guide. But you may find the below useful if you’re getting unexpected results. 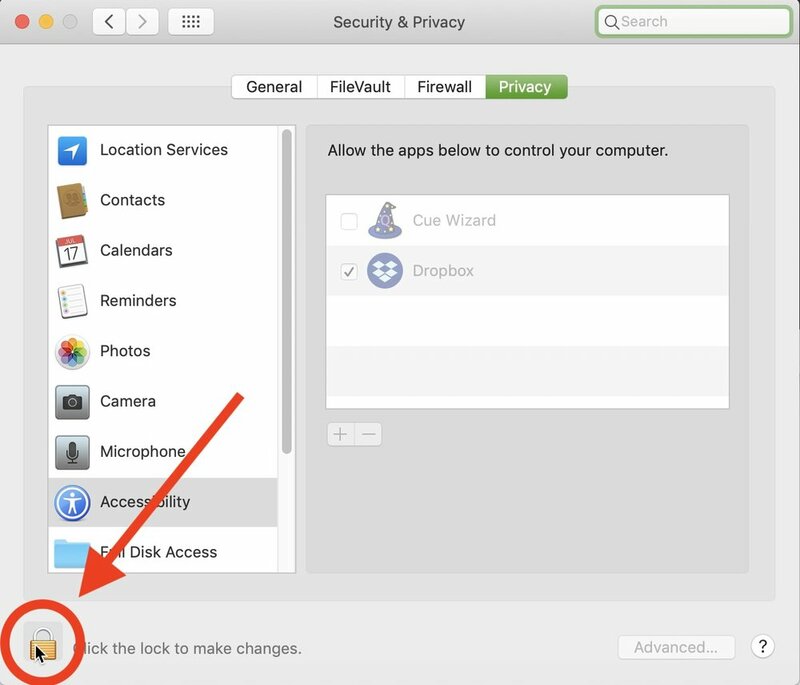 Open a workspace in QLab v4.3.4 or later. If you are using Cue Wizard for the first time you might like to try opening the supplied workspace ‘Cue Wizard sandbox’ to experiment with. Whenever you run Cue Wizard, save your QLab workspace first! The first time you run Cue Wizard, depending on your version of Mac OS X, you’ll get a bunch of alert boxes saying that Cue Wizard is trying to control “System Events” (click OK), that it would like to control this computer using accessibility features (Click Open System Preferences, Click the padlock in the bottom left corner of the Accessibility system preference, enter your username and password, then click the tick box next to Cue Wizard. Now head back over to Cue Wizard to tick one last box! You’ll only have to do this the first time you run the program on your computer. In the top section of the first Cue Wizard window, you are asked which cues you’d like to search for. In the ‘Search for:’ dropdown box, there’re a large range of options to choose from. You can choose from only operating on certain cues (such as all MSC cues); or you can choose to search for text in the cue name, number, or notes; or you could search for all cues that route to a certain audio output. Or you can choose every cue. Finally, at the bottom of the first window is the option to create a Log file. This creates a text file on your desktop called ‘Cue Wizard log’, with the date and time you started Cue Wizard appended to the end. This log file is a great way to create reports about cues in your show. For example by doing a Search for all MSC cues, then hitting quit when you get to the modifications page, you can generate a text file of all your MSC cues in your show. The log file has been formatted so you can drag it into Excel and see the information more neatly. The log file is very useful if you are getting unexpected results rom running Cue Wizard, as it also logs your search and modification parameters as well as the search results (with some background information on how they are referred to within QLab) and which cues it changes, and how. When you click ‘Search for…’, Cue Wizard may ask you a couple of questions, such as what text you want to search for, as relevant to your search criteria. It’ll then search through your cuelist. You’ll see a pop-up window with a progress bar if you have a large QLab workspace. The log file will be populated with the search results. If you chose ‘view one by one’ above, a persistent dialog box will pop up allowing you to infinitely scroll backwards and forwards between the cues that match your search criteria. IF possible, Cue Wizard will show you the nearest match to your search criteria based on your current selection in the workspace. If it can’t determine that, it’ll start from the to pop the cue list. No cues will be modified at all when you choose this option. But you are free to edit them in QLab and come back to Cue Wizard when you’re ready to edit the next search result. For example, you might want to Search for all audio cues that route to audio output 7. You could then Copy (Apple-C) your first search result in QLab, then use Cue Wizard to move around all other cues routing to output 7 and do Paste Cue Properties (Apple-Shift-V) to paste the settings of your first search result to the others. Try pressing Control-F7 on your keyboard (or System Preferences > Keyboard > Shortcuts, then click ‘All controls’ below Full Keyboard Access. This enables you to use Tab, and Shift Tab to move around the Previous and Next buttons more swiftly. If you chose either the ‘modify one by one’ or ‘modify all’ options, Cue Wizard’s Modifications window will appear next. This allows you to select how Cue Wizard will modify the cues that met your initial search criteria. The options in this dialog box can be a bit confusing, as there are many possibilities. You might want to open the supplied QLab workspace ‘Cue Wizard modifications sandbox’, Do a Search for.. ‘All Cues in all workspaces & cue carts’ and choose ‘Modify one by one’, then experiment with how the options in the Modifications window affect the cues in different ways. Flag them (which puts the Flag symbol in the far left column of matching cues in the QLab cue list. Change the colour label to a specific colour. There are the standard five available colours, plus a couple more. You can also chose to remove colour labels by selecting ‘none’. Change the text of the cue name, number or notes. (Which is where our options get a bit more complex). You can choose to do all, any, or none of these options. If you just click ‘Do It!’ with everything set to ‘Don’t change’, Cue Wizard will scan through the search results without making any changes. Cue Lists are commonly assembled using Group Cues to contain all the nitty gritty of the QLab programming. Sometimes you may want Cue Wizard to operate just on the root level of the cue list and to ignore the contents of the groups themselves. The option ‘Include cues within groups’ allows you to either ignore the contents of any groups, or change them. By default it is set to change cues within groups. The real power of Cue Wizard comes from how it can change the cue number, name and notes of the cues that meet your search criteria. It’s easiest to understand how to use these features by considering a few examples. For example, we may have Searched for all MSC cues in our Search window. In the modifications window, we could choose to change the colour label of them to green. We could use the ‘Change the Cue Name’ | ’Prepend with text’ feature to add ‘LIGHTING CUE: ‘ to the start of the cue name (assuming we were using MIDI Show Control to send MIDI commands from our QLab machine to a lighting desk (or another QLab) that was running the lighting). We can also perform a second search for text, in order to replace it. For example we may initially have Searched for all cues containing the words ’Temporary VO’ in the cue NOTES field. We could now choose to search through the search results from that, and do a Find and Replace on the cue NAME to change ‘VO’ to ‘VO NEEDS REPLACING URGENTLY!’. Or perhaps we initially searched for all audio cues routing to output 7, now we could Find and Replace in cue name of all cues that route to output 7, swapping ‘VO’ for “VO routed to TV speaker’. Cue Wizard would modify cues that are routed to output 7 and contain ‘VO’ in the cue name, but wouldn’t modify the cue name of other cues. (It would flag or change the colour label of ALL cues that route to output 7, because that is independent of our Find and Replace on the cue name). To get the most out of Cue Wizard, it is worth understanding a bit about how QLab generates names for the different cue types and files you drag into a cue list. When you drag an audio file onto QLab’s cue list, you’ll see the filename of that appear in the cue list as it’s cue name. Often we leave that untouched - but sometimes we edit that filename. When you make a fade cue, it is initially blank. When you drag an audio file on to it, you’ll see QLab generate a name for it: ‘fade ‘ and then the cue list name of the audio file. If we drop a sound file called I AM A SOUND FILE.wav on to the cue list, it appears to have the cue name ‘I AM A SOUND FILE.wav’. If we make a fade cue and target our audio file, the Fade cue appears to have the cue name ‘fade I AM A SOUND FILE.wav’. But these cue names are fluid. If I change the name of the sound file in the Mac Finder to ‘I AM A GREAT SOUND FILE.wav’ both the cue name of the audio file, and the fade cue will change accordingly. Note how cue 6 and cue 11 have taken their name from the filename. Cue 7 and 12 are copies of cue 6 and 11, but with their names manually edited. Changing the file name, QLab automatically renames cue 6 and 11. Cue 7 and 12 don’t because we have manually edited them. The same principle applies for many of the cues within QLab. There are essentially two types: what I’m calling Source cues, and Control cues. Source cues are 'Audio', 'Mic', 'Video', 'Camera', 'Text', 'Network', 'MIDI', 'MIDI File', 'Timecode', 'Script', 'Light', 'Wait', and they all create names based on what they target or do. Control cues, which are 'Fade', 'Start', 'Stop', 'Pause', 'Load', 'Reset', 'Devamp', 'GoTo', 'Target', 'Arm', 'Disarm’, all create names based on the other cue they control. This dynamic naming is often very useful, particularly for Control cues, so we don’t necessarily want to overwrite it with text, because as soon as you manually edit the dynamic cue name, it becomes frozen and unchanging. If I edit a Fade cue’s name from it’s dynamic ‘fade I AM A SOUND FILE.wav’ to ‘Fade out: I AM A SOUND FILE.wav’, were I then to rename the file to I AM A SOUND FILE.wav (or change the target of the Audio cue to a different sound file altogether), the Fade cue will be locked to saying ‘Fade out: I AM A SOUND FILE.wav’. If you’ve selected it to rename the Cue Names, Cue Wizard will rename all manually named cues, but it then lets you choose whether to also change the cue name of Source cues and Control cues, independently of each other. Often it makes sense to rename the Source cues and ignore the Control cues, which is the default setting. If you’ve chosen to Erase all text in the Cue Names, it will erase all manually entered text, and the dynamic names will revert to being visible, if they are normally. Memo cues follow a slightly different convention, and as we often use them as ‘spacers’ in a cue list, they deserve some special treatment. You’re given the options to change the cue name of Memo cues according to your modification preferences; or to do that, but to ignore any blank memos; or to ignore memo cues altogether. (This all assumes that Memo cues are included within your original search criteria’s results). If you’re having trouble with the cue name, look at the Log file which displays how each cue is named - drag it into Excel or Numbers to see the details more clearly laid out. The cue name field is what you have manually typed in, if any. Cue List Name is what will appear in the cue list (which might be your manual name, an auto-generated name, or be blank) (It’s the name as it appears in the cue list, not the name of the cue list that the cue is in!). Cue Display Name is what is displayed in the standby view (eg Untitled Script Cue) at the top of the main QLab window, or in a Cart. Cue Default Name is what the automatically generated name would be (which might be blank for an untitled script cue). Cue Wizard uses the Cue List Name field for searches. Changing the text of cue numbers can be tricky because QLab rightly prevents you from giving two cues the same cue number. If you try to prepend all your search results’s cues with ’SQ ‘ it’ll name the first cue without an existing number as ‘SQ ‘; then it’ll try to name the next cue without an existing number as ‘SQ ‘ too, which QLab will prevent. Often we may have cue numbers on our group cues, but the nitty gritty programming within the groups may not have any cue numbers. You have the option to change the text of those cues with blank numbers, or to ignore them (and only change the cues with existing cue numbers). We don’t have the same problem with cue notes as we do with cue numbers. Cue notes can be anything you like, and you can also paste in pictures and give text rich formatting, which is to say, different fonts, bold, italic, and colours. Due to a limitation with the programming language Cue Wizard is written in (AppleScript), if we modify the text in the Cue Notes at all, we lose all the styling information, and it reverts to plain text. Sometimes, this can be useful: if you copy and paste text into QLab it’s not very visible (as most text is black on a white background, and QLab has a dark background). The ‘Strip Notes rich text formatting’ option in the ‘How would you like to change it?’ Dropdown box lets you remove all text formatting from the Notes field so it goes back to being plain white text. Again you have the option to change blank cues, or to leave them alone. If you chose to ‘Modify, one by one’, you’ll now get a persistent pop-up window which will walk you through each of your search results, and preview how they will be modified and ask you if you want to ‘Change it’ or ‘Ignore it’. After you’ve chosen, it will move on to the next cue in the search results. If you chose ‘Modify all’, you’ll see all your cues changing in QLab quite swiftly! Once complete, either your log file will open up, or a final dialog box will appear to let you know it’s complete. The Log file will be updated as each cue is modified. You can always use QLab’s Undo feature to work back through what Cue Wizard has done, but it can do quite a lot so it’s always good to have saved your workspace before running Cue Wizard. The Download link is up at the top of the page!